Last updated 31 August 2016 . By Charlotte Howes. A hidden doorway. Co-ordinates on the floor to mark the spot. Descend the dimly lit staircase and...you're in! The Bootlegger is the City's speakeasy cocktail bar that keeps the drinks flowing and the good times rolling even in the face of that pesky 1920s prohibition. 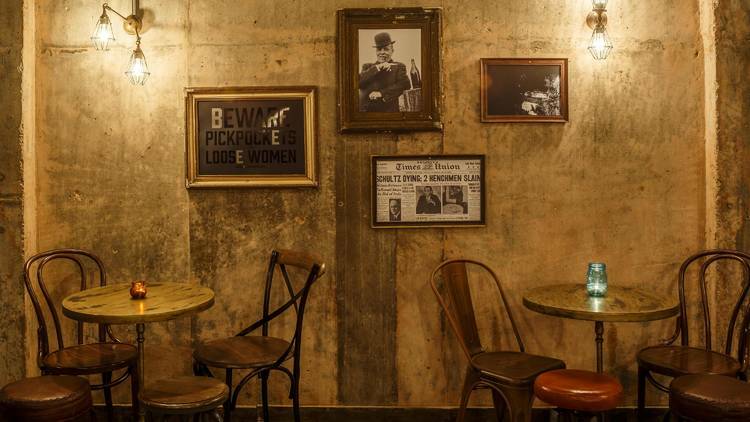 The Bootlegger is fantastically well-hidden, just as any good speakeasy should be. In fact on my first visit I wandered past the entrance a good three or four times without realising I had found it. You can get quite a kick out of the impressed look on a friend's face when you open up this well-hidden, blacked-out door; which to an unsuspecting eye looks little more than a service entrance for one of the adjoining buildings. Inside is all about low, romantic lighting created by the candlelit tables and industrial-style fixtures, exposed walls and bare wood floorboards. Combine that with the antique upright piano standing in the corner, a collection of decorative 1920s furniture and the vintage prints adorning the walls, and you have a wonderful setting for an authentic 1920s knees-up. By 7pm on a hot summer's night, this underground bar hidden beneath our City's streets was a cool sanctuary from the bustling commuter crowds up above. Already the tables were all lit by candlelight, a jazz band was setting up in the corner of the venue, and the bartenders were busily mixing up some of the finest drinks on offer behind the bar. The vintage feel works perfectly with the speakeasy theme - check out the newspaper cuttings and twenties slogans adorning the walls. With the music starting to swing and happy after-work revellers settling in for the evening, we sat down to enjoy some of the Bootlegger's great cocktail concoctions ourselves. Dolled Up (£10.50) and ready to go, it seemed like a pretty good way to start the evening - with rum, a load of fresh berries and just a dash of lemon. Soon we were doing a rather accurate enactment of the Giggle Juice (£10.50) ourselves - aptly named I feel, and one of my favourites. Grey Goose Pear Vodka, shaken with fresh ginger and pears - add a little honey and some apple juice and this refreshing concoction is a win. Both by now feeling like the Queen of Sheba (£9.50) - a wonderful mixture of gin, blueberries and lychee liquor - we tried our luck with a Hinky Flip (£12). No, we weren't doing cartwheels in the centre of the room, we were instead presented with inconspicuous but rather heavy hard-backed novels, hidden inside which were hip flasks filled with the Bootlegger's potent 'emergency drinking water'. After having a bit of a run in with None of your Beeswax (£10.50) it was soon time for the gin-infused Getaway, (£9.50). With those prohibition hounds Hot on the Trail (£12) - let me tell you this flaming concoction of Courvoisier with blackberries and spices really packs a punch - we were Half Way Across the State (£9.50), a tequila-induced state that is, mixed with Chambord, fresh lime and raspberries, before we realised the time. A fantastic array of colourful cocktail concoctions - you'll have a hard time deciding which to try first! You can't help but love the Bootlegger. And it's clear as soon as you enter that those who have already found this great little spot certainly do. 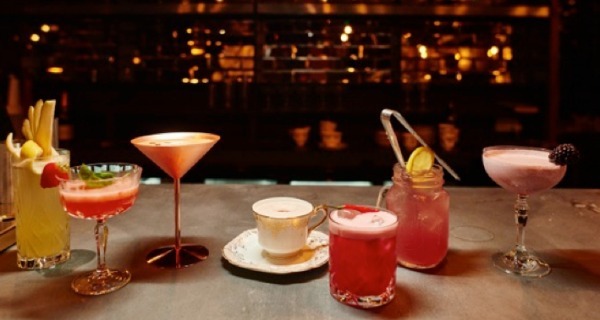 With its charming 1920s theme, its great selection of expertly mixed cocktails, and the fun, excited vibe running throughout, it is the underground speakeasy bar that I'm sure would have got those early twenties' swingers through both the good times and the bad. Speaking of which, the music is also great. Throughout the week a fab line up of live jazz bands play at the venue, transforming it into a lively and buzzing jazz venue. After a few drinks people are getting up and joining the musicians on the boards - in fact we weren't there long before I was pulled to my feet and swung enthusiastically round the room. 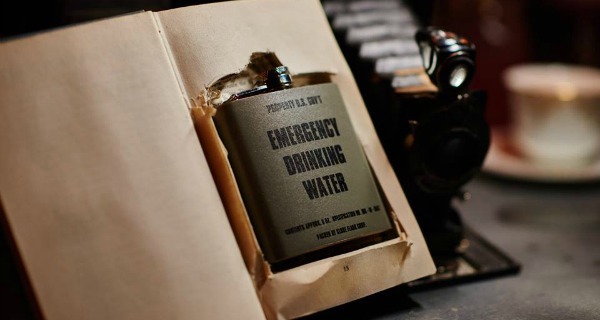 I am sure the cleverly concealed emergency drinking water will get you through just about any situation. The Bootlegger is fantastic and fun. You'll go for a couple of after-work drinks and end up staying all evening. My advice? Go with your dancing shoes on, start with the Giggle Juice, and while away the night in a haze of lavish cocktails and sultry 1920s glamour. Customer Success Executive at DesignMyNight. Mojito lover. Born and bred Londoner enjoying rediscovering the city after a ten year hiatus.